"Five Soldiers were Killed in Action"
The 3d Battalion, 329th Infantry, received orders on the morning of 12 April to move as rapidly as possible through their sector to the Elbe River, capture the railroad bridge at Barby intact, if possible, and be prepared to cross the Elbe River. The 1st Battalion, which was to follow, had the responsibility of thoroughly mopping up the area, while the 2d Battalion, in the right half of the regimental sector, was not only to reach the river but protect the regiment's right flank.Leaving Gnadau (D7883), the 3d Battalion directed I and L Companies to Pommelte (D815850) as K Company continued to move due west.I Company, preceding L arrived in Pommelte about 1200 and was informed that elements of the Recon that was preceding them having eighteen men of I Company's 3d Platoon attached, had run into a heavily held out post line (D836838) of dug in machine guns and panzerfausts. It was also learned that a percentage were able to withdraw, but a large number of men were pinned down under a terrific volume of fire. Plans were formulated and the company moved out at 1230 along the right side of the Pommelte-Barby road. The 1st Platoon led out, in open column, followed by the 2d Platoon, weapons platoon, and the remainder of the 3d Platoon. The company, in extended column, followed a ditch which offered very good cover to (D825844) at which point the ditch ceased to exist. Here the 2d Platoon swung to the right and moved abreast of the 1st Platoon, as both moved forward with two squads forward and one in support. The 3d Platoon remained in Company support. Four light tanks, which had been attached to the company, formed a line parallel and just to the rear of the forward elements, as the rapid advance continued to the edge of the orchard (D830838), at which time the company came under intense fire. The infantry and tank being somewhat taken by surprise, fired everything they had at any and all likely areas occupied the reason being when Jerry had dug his foxholes, all surplus dirt had been removed, making it impossible to get a line on the individual holes. K Company, all this tine, had been advancing toward Barby along the Gnadau road (D822827), and upon reaching (D835327), the company encountered frontal fire from town and flanking fire from the positions holding up I Company. Being unable to advance, the platoons slowly worked themselves into position, dug in, preparing to "slug it out" with the enemy. L Company arrived at Pommelte shortly after I Company and remained there in Battalion Reserve, awaiting commitment orders. 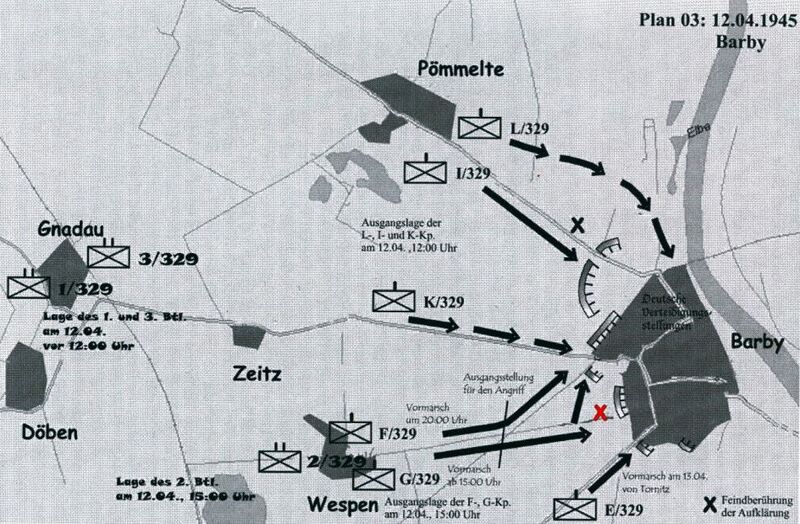 The 2d Battalion, on 12 April, having advanced against practically no resistance, reached a general line Tornitz-Wespen, in the late morning, southeast of Barby. Company G and one platoon of the 643th TD BN Reconnaissance Troop in Wespen, were sent to Barby to aid the 3d Battalion which was know to be having trouble on the outskirts of town. At 1500, the company left Wespen on the secondary road leading east, preceded by elements of the Recon consisting of three jeeps and two armoured cars. The 2d Platoon, Company G, followed on four light tanks, while the 1st, 3d, and weapons platoons, in that order, rode vehicles of all descriptions. As the Recon approached (D844818), the leading vehicles received a heavy burst of fire, wounding quite a few men. The follow up vehicles had just crossed a slight knoll as the fire began, thus they stopped and started to back out while the 2d Platoon of G Company deployed moving forward with the tanks to give supporting fire to the forward elements. The ground being very flat to the immediate front, smoke was necessary not only to corer evacuation of the wounded but permit the 2d Platoon forward to building up a line along a slight embankment (D840818). As the 2d Platoon advanced forward the tankers were also given the mission of moving to (D842818), under the protective cover of the smoke, establish a line and cover the withdrawal of our men. The other platoons having dismounted continued cautiously working their way up the road in open columns on either side of the road. The smoke laid down undoubtedly saved the day, for the Recon and most of the wounded were able to get out. Upon near completion of the evacuation the tanks that had moved into the field were pulled back across the bridge (D840817). Shortly thereafter the 1st Platoon joined the 2d forming a line of skirmishers, with the tanks interspersed. This force swung north, moving along the west side of the creek to the first group of buildings at (D840824), thus anticipating to easily by-pass this strongpoint. As the platoons started for their new objective, Lt Littlepage received word that five medium tanks were being placed at his disposal, the rendezvous point being (D839818). Keeping a few of his riflemen with him, as security for the tanks, the tanks upon arrival were given positions enabling them to cover the east sector of the town by fire if need be. The 3d and Weapons Platoons of G Company, upon reaching the railroad crossing (D830815), moved northeast along the west side of the railroad embankment and at 1600 joined the remainder of the company in the two houses already held. All this time, 1st Lt. Arthur D. Littlepage, CO, did not know the location of these two platoons, for he had had no communication with them since the action began. It was not until 1700, upon his arrival at the company CP, that he was enlightened as to their whereabouts. "At this point, things were relatively quiet", stated Lt Littlepage. Word was later received, 1730, to hold their position and wait for F Company. Upon receipt of this order, a patrol of two men was sent out to contact elements of the 3d Battalion, approaching from the west, however, the word of contact was never brought back and both men were found dead the next morning. While Company L remained in Pommelte, 1st Lt Alden D. Allen, Commanding Officer, stored with the Battalion Commander all afternoon keeping in touch with the progress of the two forward companies. At 1700, the 1st Platoon, Company L received word to establish an outpost (D832841) to protect not only the left flank of I Company but the battalion as well. From the Battalion observation post, at 1830, I Company was noted having trouble thus L Company was committed to its left. Leaving the 1st Platoon in its position, the 3d Platoon, at 1830, began infiltrating forward and building up on its left flank. The only available cover on this move, keeping the mission in mind, was a ditch on the left side of the road which was utilized to the fullest extent. The 2d Platoon, advance by bounds, remained in the rear. As the two leading platoons came abreast of each other and prepared to continue the attack, the platoon of attached medium tanks were brought forward, forming a line behind the 1st and 3d platoons, for the purpose of supporting by fire all movements made by these forward elements. Upon reaching the creek (D843835), the tanks were stopped for this barrier was about waist deep, four feet wide, and the banks very abrupt. The forward infantry reached the creek slightly before the tanks did, 1845; and being held up but momentarily, continued their advance. Confusion was nil, yet a gap between the two leading platoons began to materialize rapidly. Without orders from the Company Commander, the 2d Platoon leader ordered his men forward to maintain contact between platoons. Sniper fire, although not accurate, was encountered coming from the town and the high ground across the river. However, by the use of "Marching Fire," the rapid advance was not impeded; and the factory (D847834) which was their objective, was reached by 1900. A short time later, 1945, the railroad bridge was blown. Having thoroughly searched the factory area, patrols were sent to probe the river's edge while the rest of the of the company set up a defensive position in front of the factory, facing the river with all three platoon on line. The next morning, 13 April , L Co cleared the other factory that was close by without firing a shot. The company again remained the rest of the day, crossing the river about 0400, 14 April. Although L Company had apparently walked up, so to speak, and sat down on their objective, I Company was still engaged in a fanatical fight. Being unable to see, due to camouflaged, the only thing to be fired at was possible positions and one or two Jerries whose heads might be seen bobbing out of his foxhole too fast. The 3d Platoon, although not having been committed, was only a few hundred yards to the rear of the front lines and was being subjected to the same fire holding up the 1st and 2d Platoons. During these hours of give and take, it had grown very dark. Company I was ordered and jumped off in an attack at 2030. Fire minutes prior to H-Hour, three assault guns, which had been attached to the company, arrived. Crossing the line of departure, the edge of the orchard, both rifle platoons, tanks and assault guns, which were all on line, preceded speedily forward, each weapon firing as rapidly as humanly possible. The Jerry positions being only a hundred yards distant were rapidly overrun. The companies did not stop here but kept moving forward to a point about 500 yards from the railroad. Although the support platoon had made an effort to clear the area passed over by the leading elements, due to the darkness, many of the enemy were never detected. The remainder of the company, tanks, and assault guns having reached (D838833) about 2100, were having difficulty in maintaining direction and keeping contact. It was then decided to move back to the original position and wait the rest of the evening. While back-tracking, a few of the Jerries that had been overlooked started sniping; however, they were dealt with shortly. The company was again in its original position about 2300, awaiting the light of dawn, at which time another attack might be launched. The tanks and assault guns continued back to Pommelte for the evening. Initially, Company F had ban in reserve in Wespen (D8181). Having been alerted around 2000 on 12 April, 1st Lt Ira E. Boyer, Commanding Officer, made a reconnaissance prior to the mone. His mission was to move his company to Barby (D8582), then kick through G Company and secure a larger foothold in the town. Battalion had reported G Company as holding a complete block in town, however, that was later found out not to be true. The company left Wespen at dusk, in open column, with the 1st Platoon leading, followed by the 2d, Weapons, Headquarters and 3d, on the Wespen-Barby road. At the railroad crossing (D830815) the company veered off the road and proceeded along the left side of the railroad tracks, to the crossing at (D840825). Here the leading men of the 1st Platoon turned right and proceeded along the road toward Barby, for about fifty or seventy-five yards, at which point they held up. The second building on the left of the road was on fire, as was a large school (D841823), making it impossible for them to move without being seen and drawing intense fire. The Company Commander went forward, contacted G Company CP, in the first building on the right side of the road, and found that it was one of the only two houses in town held. The other building being immediately across the road. Lt Boyer, at this time ordered a patrol toward the town in an attempt to determine the strength and disposition of the enemy. The patrol, however upon entering the lighted area, was driven back by automatic weapons and panzerfausts. Seeing the situation confronting him, Lt Boyer requested permission from Battalion to set up a defensive position along the tracks and await dawn. Permission was granted about 2300. The CO having omitted one thought in his request planned to drop back to (D830815) before setting up his defensive area; thus, whether knowingly or not, he had chosen an extremely advantageous position. About the same time F started pulling back, another patrol was sent out to skirt the southern edge of the illuminated area and approach Barby guiding along the Barby-Wespen road. Being in radio contact with the command post constantly, they reported their crossing of the creek (D840818) at 2400, and having received some small arms fire. A few minutes later they again called stating they had reached (D844817) and were returning because of intense small arms fire. All was not quiet for G Company the early morning of 13 April. Shortly after midnight the Jerries infiltrated a few men close to the supporting tanks, which had been placed around the command post. Six panzerfausts were fired although no great damage was done. These individuals were warded off and then at 0100, the building in which the CP was located received a hit by a bomb dropped from of lone German plane, who after dropping the one bomb was not seen nor heard again. The result of this lucky hit was eight men wounded. The 1st Bn spent the night of 12 April in Wespen and Gr Muhlingers in Regimental Reserve. The following morning, 13 April, orders were received to continue the attack at 0845, but G Company, having contacted the burgomeister, found that the troops were pulling out and that the town would surrender at 0900, so the jump off was postponed fifteen minutes. Then, at 0900, the 2d and 3d Battalions moved tactically into Barby and established themselves along the west edge of town. This was done preparatory to giving supporting fire to the 1st Bn, 329th Infantry which had been picked to make the initial assault boat crossing of the Elbe River. Both the 2d and 3d Bns had suffered fairly heavy casualties in this brief action, the aggregate number being 24 men and 1 officer killed, 35 men wounded and five men were missing. Shortly after the battalions had moved into positions, E Company arrived from the vicinity of Tarnitz where it had been providing flank protection, and aided in the clearing of Barby also sending one platoon to (D864816) to establish an out post and cloy the proposed bridging site. Having cleared the town thoroughly, the company also established road blocks. 1st Lt Earl E. Hoover, Executive Officer, said, "These were the best soldiers I have ever seen." The backbone of the defense of Barby was the 1st Bn, 1064th Inf Reg, Potsdam Division. This was one of the three newly-formed Divisions organized in the vicinity of Berlin within the previous ten days. Personnel were mainly NCO's and officer candidates released from the NCO and reserve officer's school in the Berlin area. The defense of what at one time was considered the three largest natural barriers confronting our troops, The Weser, Leine, and Elbe Rivers were very weak and poorly utilized tactically. It seems strange indeed, having natural obstacles already existing, that at least hastily dug fox holes were not established along the far shores of these rivers. Instead, they seemed to withdraw in mass, so to speak, many kilometres to points not as advantageous for defensive action. This very type of thing happened at both the Weser and Leine Rivers. However, when they did see fit to defend the Elbe, all orthodox tactics seemed to be thrown to the fore winds. Instead of establishing their line on the far side of the river, where havoc might have been raised with the assaulting troops while on the rivers, the Germans preferred defending it on the near aide. Thus, they were confronted with two obstacles, our advancing forces to their front and quite a sizable river to their rear. However, this might have been done in order to prevent, as much as possible, anybody from withdrawing of their own accord. Sunday October 30th, 2011 I returned home from a 2 day’s visit to the City of Barby in Germany, Barby is located near the Elbe river approximately 100 miles South-West from Berlin. On April, 12th 1945 Five soldiers of the Recon-Company were KIA near the City border. On Saturday October 29th I placed some flowers on that spot to remember this terrible tragedy. I Especially made this trip to see where this tragedy took place but first of all to commemorate my adoption Sgt. Michael DeFebio.